Whether you are thinking about selling your home or not, it is never a bad idea to think about organizing, reorganizing and downsizing the amount of stuff you manage to accumulate over time. If you have been thinking about selling your home and are looking to cash in on a seller’s market and full market value, it is imperative that you de clutter your home before putting it on the market. Here are 3 tips to help you de-clutter your home and get it ready for sale. Depending upon how long you have lived in your home or how many items you have managed to accrue over the years, the thought of cleaning up your home and organizing your stuff may seem a little overwhelming. If this is the case, try to set out a timetable or schedule with deadlines that you feel are realistic. This schedule can also include lists or categories of what will be sold (perhaps at a garage sale) what will be given to the local thrift shop and what will be thrown out. This red hot Niagara on the Lake real estate market may not last forever so the quicker you can get your home on the market, the better. When you are creating this schedule, try to break your home into simpler, smaller components such as rooms. 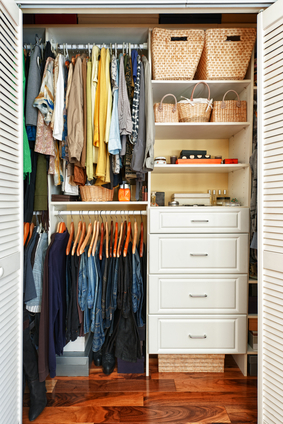 Set up a timeline that will allow you to declutter your home room by room in a systemic and time sensitive manner. For example try decluttering one bedroom a week or for more intensive jobs such as the kitchen or garage, set aside a full weekend. You will be surprised how quick the process will go when it is broken down into manageable chunks. A Clean House is a Sold House! Once you feel that you have organized and decluttered your home, it is now time to stage your home for resale on the market. A decluttered home gives the appearance of a home that has been well taken care of and this is definitely something that all potential buyers want to see. Remember, buyers want to see their lifestyle and belongings in your home, not a cluttered and chaotic portrayal of your life and lifestyle. If you have been thinking about taking advantage of this summer’s red hot Niagara on the Lake real estate market, remember that is important to declutter and organize your personal belongings before putting it on the market. If you have any questions about how to go about decluttering your home or want more information as to how I can help you sell your home contact me today. This entry was posted in Blog, NOTL Realty, Uncategorized on August 22, 2016 by Kevin Stokes.